"The best part of all is that as delicate as it appears, the platter is dishwasher safe." "With the ability to hold 2-quarts this works great to hold salads or even just left out on your counter to hold fruit." "Beautiful and practical, these salad servers are made of Mediterranean olive wood grown in Italy and made in Albania." "Measuring nine inches tall and weighing about one pound, it can hold 76 ounces of room temperature or cold beverages." "It can retain heat for up to nine hours and keep things cold for up to 18 hours." "The 12-inch diameter top is made of aluminum and can rotate, making it easier to decorate the cake, or spin it to slice and serve your guests." "The knife and cake server set features a lovely ribbon design on the handles." 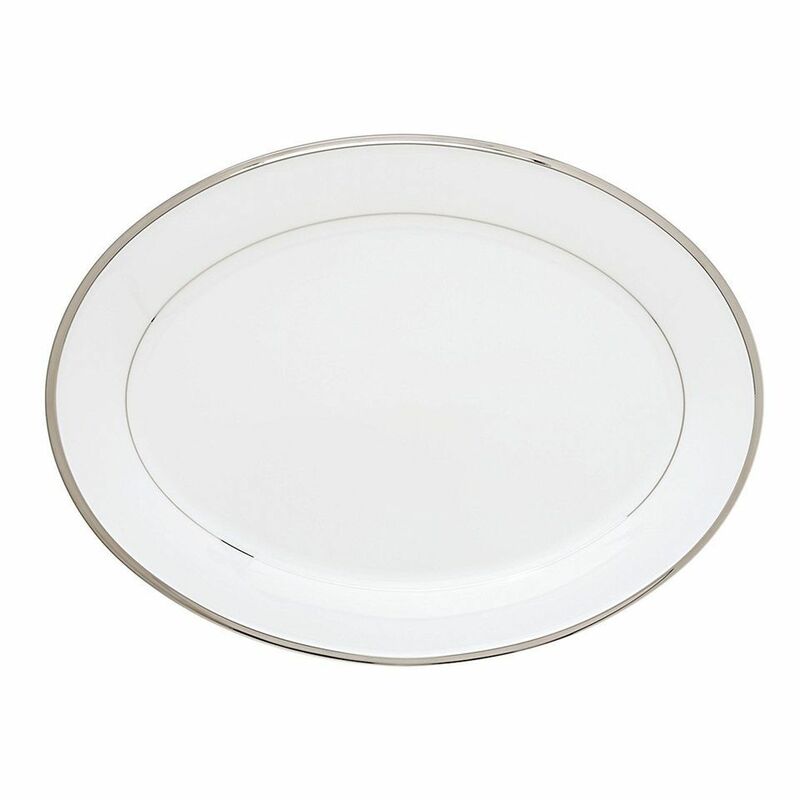 Present your food on this gorgeous white, fine china platter that features platinum accents. The best part of all is that as delicate as it appears, the platter is dishwasher safe. Measuring 16 inches long and weighing just less than four pounds, it is large enough for a roast chicken, pork tenderloin or a whole fish making it the perfect main dish at your next feast. Customers who have purchased items from this Lenox Solitaire collection have said that it’s elegant, but simple enough to use for everyday occasions. One said it’s even prettier in person than in the photo, while others have raved that the design is classic and will never go out of style. Some reviewers have cautioned against running the piece through the dishwasher just to be on the safe side since it is an investment piece. Make your greens more appealing by serving them in a beautiful bowl. This salad bowl from Fiesta comes in an endless assortment of colors (15 to be exact) so you can buy multiples for all of your entertaining needs. With the ability to hold 2-quarts this works great to hold salads or even just left out on your counter to hold fruit. It's microwave, oven and dishwasher safe so it can be used for many things beyond salad. Made in the USA and free of lead this will be your new workhorse in the kitchen. Beautiful and practical, these salad servers are made of Mediterranean olive wood grown in Italy and made in Albania. Each piece measures 13 inches long and is tightly grained so that you won’t start seeing frayed edges through the years. It’s also suggested that you occasionally coat with mineral oil to keep the wood looking its best. The pieces are safe to use with nonstick cookware and won’t scratch pans or stain. The majority of customers who have purchased this set have been satisfied with it. One said it’s their favorite wooden utensil, adding that it’s the one they grab when they cook as well as serve. They also said it’s lightweight but feels sturdy. A few have reported the spoon breaking during use, but most customers were happy with the overall performance. A classic and timeless piece, this pitcher by Waterford Vintage claims the top spot for its elegant design, durability, and overall value. Measuring nine inches tall and weighing about one pound, it can hold 76 ounces of room temperature or cold beverages. (Word of warning: some customers have reported cracking when putting hot liquids in it, so you might want to consider another one if you plan to use it for that.) Perfect for dinner parties and get-togethers, it’s a functional and pretty piece that’ll save you from having to go back and forth to the kitchen to refill glasses. Most customers have been happy with this pitcher, with some praising that it’s light enough to tote around but heavy enough to be sturdy when full. The majority of people love it for the simple and seamless style. It also makes a great present and conveniently comes in a special gift box. Serve after-dinner coffee in this stunning, insulated, stainless steel carafe that can hold up to 34 ounces. Not only does it have easy-to-use one-hand pouring functionality, but it can retain heat for up to nine hours and keep things cold for up to 18 hours. Plus, the sturdy exterior and double wall construction mean it’s dishwasher safe—an added bonus. The majority of customers have been happy with the purchase of this carafe. Besides loving the sleek style and beauty of the design, many have said it really does keep coffee warm for long periods of time. Some have said that the handle gets too hot, though, while others weren’t as satisfied with how long the coffee stayed warm. However, most customers said they were satisfied with the performance and would recommend it to others. This item stands five inches high and has a sturdy cast-iron base with a durable powder-coat finish. The 12-inch diameter top is made of aluminum and can rotate, making it easier to decorate the cake, or spin it to slice and serve your guests. And unlike other swiveling cake stands, this one is pretty enough to set out on your table. Customers who have purchased this stand have been pleased overall. Many have touted how sturdy it is and how smoothly it rotates. Some critical reviews have mentioned issues with the paint chipping off on the base as well as the fact that the top doesn’t lock so if you don’t want it to rotate, you’re out of luck. (Just keep that in mind when you’re carrying the cake and stand from the kitchen to the table.) However, the majority of reviewers were mostly happy with the overall quality of the piece. 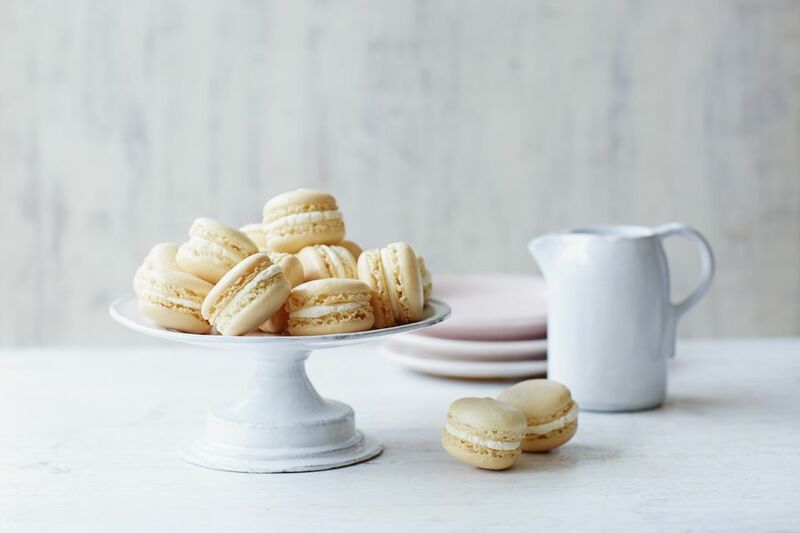 You’re already serving up a beautiful and delicious dessert, so make sure the serving utensils you’re using are just as beautiful. This silver-plated metal serving set from Lenox is perfect for a fancy dinner party or to make a weeknight meal feel more special. The knife and cake server set features a lovely ribbon design on the handles. Many customers who have purchased this set have said it’s an absolutely beautiful product—one also mentioned how great the pieces feel in your hand when you hold them. Another said it’s a great value and worth every penny. Many even used these to cut their wedding cake on their big day, so keep this in mind for bridal shower gifts as well. Some reported unfortunate defects in the set when they got them, but the majority were satisfied with the product.